Thad Moffitt (right) will be this week’s guest on Race Face TV. 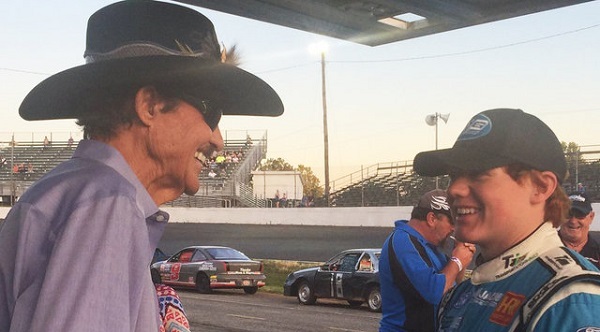 NEW PORT RICHEY, Fla. – 16-year-old Thad Moffitt, the grandson of seven-time NASCAR Cup Series champion Richard Petty, will be the featured guest on episode four of MyNetworkOne’s Race Face internet TV show, airing weekly on Wednesday nights at 8 p.m. ET. Moffitt will join Race Face hosts Rod Wortham and Katie Butchino to discuss his burgeoning driving career and family history in motorsports, offering race fans an inside look at his passion and journey towards the top levels of the sport as the fourth-generation driver looks to make his mark. The North Carolina young gun will be making his ARCA Racing Series debut this coming weekend at Fairgrounds Speedway Nashville, driving for Empire Racing, the driver development team for Richard Petty Motorsports. In addition, long-time journalist Tom Baker from RaceChaserOnline.com and the Performance Motorsports Network will return with his recurring Race Chaser Recap segment, highlighting recent standout performances from next-generation racers around the country. Tune in to Race Face every week to find out “Who’s Next” in the world of motorsports! MyNetworkOne is a full-service digital marketing agency with account executives throughout the United States and Canada. Our team of developers and designers are focused on delivering affordable, quality digital marketing services that get local small businesses noticed. MyNetworkOne is constantly evolving to address the needs of our clients and in today’s world, with the ability to connect using technology, assisting our clients to accomplish their goals from the very best resources available, no matter the geographic location. Race Face is a newly-launched internet TV show designed to spotlight “Who’s Next” among the increasing number of young drivers trying to reach the top levels of auto racing. Hosted by industry veteran Rod Wortham and Katie Butchino, airing on MyNetworkOne and produced through MNO Productions, the half-hour program has already featured several rising and top names among the motorsports youth movement, including NASCAR K&N Pro Series and ARCA Racing Series competitor Kyle Benjamin, NASCAR Whelen All-American Series North Carolina Rookie of the Year Ryan Millington and 2015 Hickory Motor Speedway Super Truck champion Tyler Dayton. Race Face is broadcast every Wednesday night at 8 p.m. ET at www.mnotv.com. The MNO Productions crew is always looking for up-and-coming drivers, willing to share their racing stories and dreams, to feature during new episodes of Race Face. To apply to be on the show, visit the Race Face website at www.racefacetv.com.